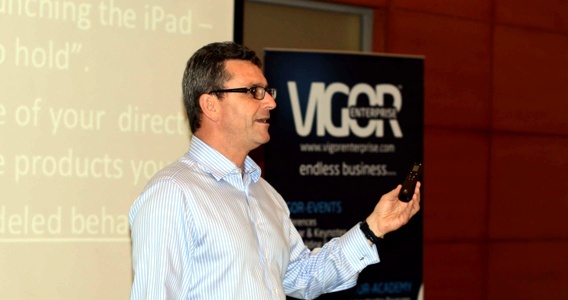 In an Antarctica simulated atmosphere, Vigor Events & ALGAS Events organized a two-day workshop in Hilton Hotel and Resort – Kuwait, Mangaf – on the 13th-14th of April 2014. The Leading Change Workshop is an intensive 8-steps program based on the unique best-selling book “Our Iceberg is Melting” by Harvard Professor John P. Kotter. “Our Iceberg is Melting” is a simple fable with profound lessons for working and living in an ever changing world. The workshop addresses the fact that, only by improving their ability to change, organizations can increase their chances of success, both today and in the future. The facilitated workshop was designed for leaders in all organizations who are facing the challenge of implementing change. Based on years of research from some of the world’s foremost thought-leaders, Leading ChangeTM takes a refreshingly simple but highly effective look at the challenges change presents. Delegates learnt a process for leading the change journey using the 8-Step leading to change developed by John Kotter through activities and exercises linked to the story of penguins on a melting iceberg as well as relating the steps to change in the delegates’ own organizations. The workshop left the attendees with a firm understanding of methods to adapt their own leadership style in the context of change which assisted them to identify principles and strategies for leading the emotional side of change as well, use a process and toolkit for leading the change process, and create a personal & business action plan for a current or future change they are responsible for. Paul Rigby – the workshop facilitator –is a regular keynote presenter at global industry conferences Paul also consults with business partners and frequently assists with partner company change, innovation, leadership and employee engagement efforts. Paul knows and understands business and what it takes to lead successful businesses in times of change and diversity. He has an incredible energy and passion and an ability to translate his hands on experience to the business world. He has learned from personal experience how to turn businesses around. Paul Rigby conducts numerous speaking engagements in over 20 countries per year. He also serves as President for, International Operations for International Thought Leader Network (ITLN) a USA based consultancy firm and Thought Leaders Learning Institute (TLLI) an Australian based consultancy firm. He is a certified master consultant for the Leading Innovation Workshop™ based upon the works of Vijay Govindarajan and Chris Trimble from the Tuck School of Business at Dartmouth, Leading Bold Change™ based upon the works of Harvard Professor, John Kotter, Leading Change™, Leading Positive Performance™ based on the work of Shawn Achor CEO of Aspirant and a world leading expert on human potential, Learn To Lead™ a 5-day leadership program for emerging leaders and Drive™ an exciting workshop based on Dan H. Pink’s work on employee engagement and motivation. The “Leading Change” workshop took place on the 13th and 14th of April.